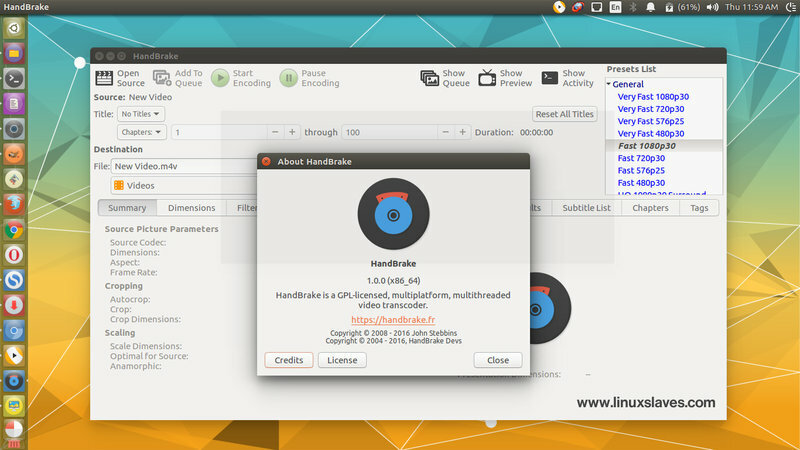 How to install HandBreak Linux - After more than 13 years of development, finally this free source video transcoder is delighted to present HandBrake 1.0.0 brings many new features, improvements to audio / video sync engine, and many miscellaneous bug fixes and improvements! HandBrake is a free tool for converting video from nearly any format to a selection of modern, widely supported codecs that available for major operating system including Linux, Mac OS, and Windows. More than free, it's open source, licensed under the GNU General Public License (GPL)! This application can process most common multimedia files and any DVD or BluRay sources that do not contain any kind of copy protection. You can take videos you already have and makes new ones that work on your mobile phone, tablet, TV media player, game console, computer, or web browser-nearly anything that supports modern video formats. It support for various subtitle streams, including SSA, SRT, VobSub and Closed Captions CEA-608, as well as support for video filters, such as deinterlacing, cropping, decomb, scaling, detelecine, grayscale and deblock. What's New in HandBrake 1.0.0? Official presets from HandBrake 0.10.x are still available under "Legacy"
HandBrake latest version can be installed on Ubuntu Linux including 14.04 LTS Trusty Tahr, Ubuntu 15.04 Vivid Vervet, Ubuntu 16.04 LTS Xenial Xerus, Ubuntu 16.10 Yakkety Yak, and its derivatives e.g Elementary OS and Linux Mint via its official PPA repository. Upgrade Notice! Before updating, please make sure there are no pending encodes in the Queue. If you are currently using HandBrake older than version 1.0.0, please also make note of any custom Presets you have created, as they may not be compatible with newer versions. Now you should be able to launch it via Unity dash or other Ubuntu app launcher. 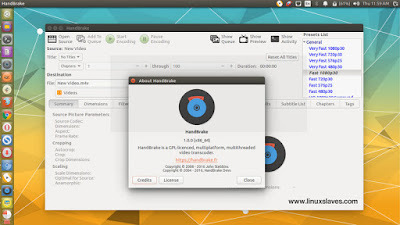 These were all the step by step tutorial to install latest HandBreak v1.0.0 in Ubuntu / Linux Mint / Elementary OS. If you need, you can get the source code.